Everyone knows it is dangerous to have slick surfaces on a boat. And everyone seems to have a formula for making a non-skid surface. You have heard of using such household materials as salt or sugar and you have seen exotic materials that cost an arm and leg. Here is the best stuff I have ever used and it doesn't cost an arm and a leg. It is a granular polycarbonite powder which can be either sprinkled over wet paint or mixed with latex or oil based paint at a ratio of 5:1 by volume. The specific gravity is about the same as the paint so, if you mix the material in the paint, it does not float or settle out in the can. Once mixed, it will keep indefinitely. 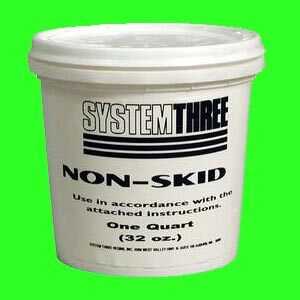 We recommend that you get an empty paint can from your paint supplier and mix the non-skid in that. Mask the area to be treated and roll on for best results. It may be brushed as well. One pound makes about a gallon of non-skid paint.
" we have mixed the polycarbonate non-skid into paint and it works just fine. The type of roller used also makes a difference on how it applies on a vertical surface. For example, I've found that the adhesive applicator rollers have a better distribution of the non-skid material compared to standard 3/8" rollers. The viscosity of the paint can also make a difference"